Let's show our solidarity by voting for the two games that really are free, complete games and not marketing tools for a commercial ones. 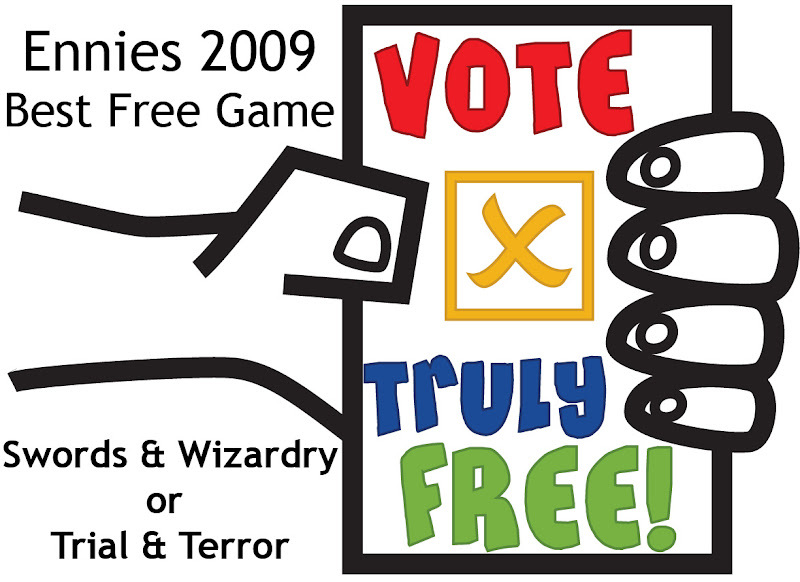 Please vote for either Swords & Wizardry or Trial & Terror in the Ennies Best Free RPG category. Every vote really does count, so mobilise your friends and family to assist! Got a website? You can help! 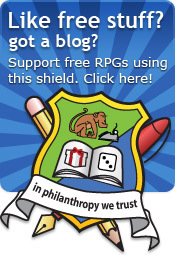 Let's spread the word together and get people voting for truly free RPGs. I did make some logos but Ennies felt they were infringement of copyright. Surrounded as I am by lawyers quoting fair use chapter and verse, I don't want this crusade to be about the Ennies logo or law. Wow, that's awesome. Fantastic work. "Major corporations." I'll bet Chris Pramas and Nicole Lindroos will be excited to learn Green Ronin, which they run out of their living room and garage, has become a faceless corporate entity, enemy of the true indie spirit. While I respect your enthusiasm for the Awards I need to point out that your use of the logo is unauthorized and must be ceased immediately please and thank you. ....right. Calling Catalyst a major corporation is somewhat laughable. Calling Green Ronin one is just simply insulting in this context. I personally don't have a problem with Battlerun being on the list, despite wanting to vote for Swords & Wizardry. It's not a quickstart, and while it is a "big name" thing, at least it's a separate product. It's also an April Fool's joke taken far, far too far, wrapping around from So Bad It's Good to Don't These People Have Work To Do to... well, brilliance. Quickstarts, though, wtf? Really? That's absurd, and I hope there's time to do something about it. Fair Use. Commentary/Criticism, I think. Anyone want to offer a better opinion on that? I support Swords n' Wizardry! I'll make sure to spread the word on the old-school/OD&D forums. Denise Robinson might be better off actually paying attention to the message of this post, rather than publically play the corporate bully. Shame, shame, shame. Thanks for the comment. I am actually using the logo under critique/criticism in an attempt to drive more traffic to the Ennies. I am not trying to profit from the use of the Logo. As you can tell from the lack of adverts and the point of this Blog. If you are still upset that I am driving traffic to your site then please do let me know and I will create a parody logo - which is unlikely to shed the Ennies is a good light. Also, I will expect you to post cease and desist messages on all the other blogs using the logo freely advertising the Ennies. If you do not do this, I'll assume that it's ok to continue. After all, why pick on me? Thanks for the comments, I appreciate that major corporation was hyperbole but I stand by the rest of my remarks. I think you're ok, Rob Lang. I was reading the same criticism/commentary link. Very "internet lawyer" of me, but I'd say you're fine. I'd ignore it. Shame that has to take away from a great idea. I'm in, I thought that was lame too. I kind of think the entries should be judged on their own merits, regardless of whether they have corporate-funded art or are part of a marketing campaign. They're still technically free, and if people want to vote based on production values, maybe that is a lesson for the Free RPG community (team up with the Free Art community?). On the other hand, if these are not complete games, just samples, they should probably not qualify. You can't really run a campaign of "Hunter: The Quickstart." 77IM, I agree that the source of the game doesn't matter. If R. Talisorian's Fuzion ruleset was in there, I would consider it equally. LOL, at 30 seconds, you're quick off the mark, Tony! 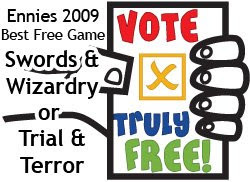 I really appreciate this campaign (I'm Swords & Wizardry) - I'm torn, because I want to win based purely on quality ... but on the other hand, I'm in the same corner because I'm in favor of real, free, games. Maybe it's naive to think I can win an ENnie against a company like White Wolf, I don't know. @ Matt Finch: That's not naive. Remember that someone with an electronic product won that category against a nominated Wizards of the Coast product one year. Banner ad is now up on my blog. Suggestions are definitely welcome on that one. Will be up on my blog in minutes...my vote goes to S&W! I also have reviews on Whitebox coming out here in a day or so.